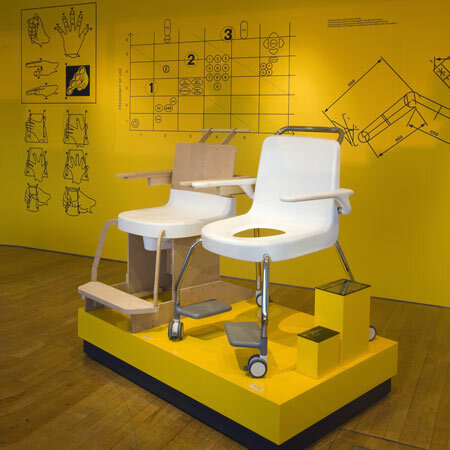 Dezeen podcast: in this podcast for the Design Museum curator Gemma Curtain talks to Fergus Bisset of Brunel University about the exhibition Ergonomics-Real Design, on show at the museum in London. In the podcast Curtain and Bisset discuss the physical and psychological aspects of ergonomics, talk us through a few key examples from the show and explain what they mean by Real Design. Objects considered include products designed for the home, medical world and industry, ranging in scale from a TV remote to the control room for a huge scientific operation. The exhibition was designed by British designer Michael Marriott with graphic designers A2 Design and presents examples of ergonomically considered designs through models, prototypes, interactive displays and finished products. The show continues until 7 March 2010. Often described as the science of everyday life, ergonomics uses the knowledge of human performance in conjunction with design and engineering to create systems, products and services which are safe, efficient and enjoyable to use. Our size and shape, how we move, what we see, hear and feel and how we think, all this information has been collated and applied by ergonomists to aid the design of both everyday and extraordinary objects. This engaging exhibition reveals the thought and process behind this science, exploring the theory, principles and methods used and applied to create usable, quality items. In an increasingly technological society, awareness of ergonomics is of paramount importance for designers and consumers alike. From the humble tape measure and TV remote control, to the vast and complex areas of transport systems and medical care, ergonomics is the study of how we interact with products, the relationship between man and machine, with the primary aim to optimise this symbiotic affiliation. Ergonomics is the unsung hero of good design and is often only noticeable by its absence, when a product is badly designed or fails to be user-friendly. It’s a thin line between mistaking the hot and cold tap to averting an air traffic disaster or power station meltdown. A misplaced element in either system can be fatal and whilst the consequences are majorly different the theory is much the same. Through prototypes, interactive displays and examples of ergonomically designed pieces including the Sky TV remote and the CERN Control Room, this exhibition reveals the importance that ergonomics plays in creating design for the real world. This exhibition is a joint collaborative between the Design Museum and Brunel University and was made possible with a grant from the Engineering and Physical Sciences Research Council under its Partnerships for Public Engagement programme.